Frigidaire stainless steel cookware is designed to work perfectly with any cooking surface. 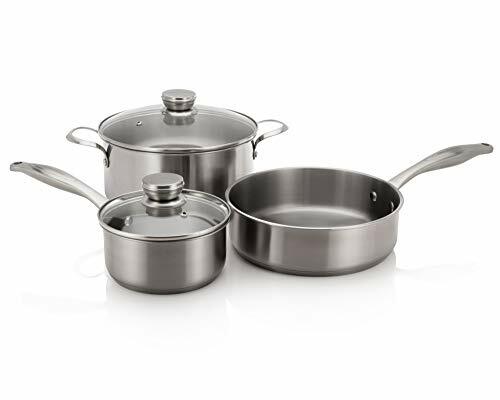 The set features a 3-quart sauté pan, a 1.5 quart sauce pot with lid and a 5-quart stock pot with lid. Pans and lids are dishwasher safe for convenience and each handle is riveted for durability. Vented glass lids allow visibility during cooking. Brushed stainless steel with a heavy aluminum core ensures fast even heating on gas, electric, and induction cooktops.